Gifts can be powerful. They can brighten someone’s day, communicate friendship, and keep romantic relationships fresh and exciting. When applied to the business world, giving gifts to prospects or clients can turn leads into clients and relationships into referrals. Dropbox recently saw great success with its two-sided incentive program. Any users who invited a friend to try the service earned extra storage space for themselves and the friend. This approach helped increase sign-ups by 60 percent. Dropbox grew its user base from 100,000 to 4 million in 15 months with zero ad spending, and the gift of space helped propel its success. These types of referrals and rewards can accelerate your business growth. But how can you give a business gift that catches a lead’s attention or prompts a referral without appearing pushy or desperate? As with most things in business and in life, timing is everything. There are three identifiable stages in the life cycle of a business gift that correspond directly to the sales cycle. Knowing these connections can help you provide the gift that’s best-suited for each stage. When you first reach out to new prospects, any gift that will stay in sight for an extended amount of time is a good choice. A fruit basket with your company logo on it could be the perfect reminder to potential clients that you care about their health and business. A recurring gift can also work well to stay top of mind. Receiving a fun reminder of your company each month can help maintain a connection until your prospect is ready to convert. At this stage, you want gifts that are pleasant but low-key reminders so you don’t seem overbearing or desperate for the prospect’s business. For your current clients, it’s important to make your gifts a bit more personal and memorable. Does your client talk about how much she loves your city’s basketball team or a band that’s going to be in town next month? Tickets to a sporting event or show might be appropriate if you know the client enjoys those events. If you take a client to an event personally, refrain from discussing business. Remember, you’re trying to make a personal connection, and business must sometimes take a back seat. Once you’ve earned a client’s business, keep yourself top of mind by regularly connecting with her in meaningful ways. If you come across an article you think might be of interest or a business tip that might improve her bottom line, send it over. As long as you provide value, you shouldn’t worry about annoying the client because your extra effort will be appreciated. These small gestures show you care about your clients and want them to succeed. As a result, your loyal clients will be more likely to refer their colleagues or friends to you. Who is the intended recipient? How expensive should the gift be? How much will the prospective client be spending with your company? Give a gift that fits how much your clients have invested in you. For instance, if a potential customer is interested as a shareholder, then golf balls, tees, computer accessories, or small appliances could be appropriate. However, if the prospect plans to spend a substantial amount of money on your product or service, then a cheap pen isn’t going to cut it. Even when a gift is small and inexpensive, it’s still a social contract. Think of business gifting as a kind of gentle blackmail. This idea stems from a phenomenon called reciprocity, which is based on the notion that people have a really hard time being in another person’s debt. If you are generous from the start, your clients will be more likely to reciprocate your generosity. When done right, potential clients will usually place an order or hire your services to ease the feeling of being in debt. If you continue to over-deliver for existing clients with thoughtful gifts, they’ll feel compelled to recommend your company to others. Giving gifts isn’t just about receiving something in return, though. Your clients deserve to be thanked for their business and the referrals they bring to your company. By understanding the life cycle of a business gift and how each stage works to forge long-term bonds, you can build lifelong relationships that both you and your clients can feel good about. A professional ballerina-turned-entrepreneur, Emily Egbert is the co-founder of HitUp, an app that allows customers to purchase and send business gifts to clients or employees in an efficient and personalized way. 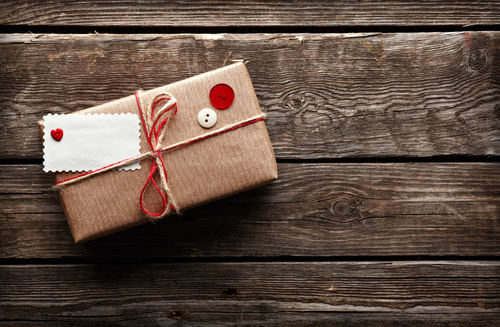 Sending and receiving gifts should be as easy as sending an email or updating a social media status, yet it still takes a long time to wade through the process of purchasing a gift and sending it. HitUp is designed to change that by making it incredibly easy to send gifts and establish or build relationships offline.